The F-15SA is the most advanced production F-15 Eagle ever built. Saudi Arabia ordered 84 new build F-15SAs and close to 70 kits to upgrade their existing F-15S fleet to the SA configuration. Just one part of this upgrade is the activation of Eagle’s outboard wing stores stations, which will expand the jet’s already heavy combat punch. The F-15SA is an incredibly capable machine, featuring some key changes from its progenitor, the F-15E Strike Eagle. These include a full fly-by-wire flight control system, APG-63V3 Active Electronically Scanned Array (AESA) radar, digital electronic warfare and radar warning suite, missile launch detection system, updated flat-panel display cockpits with helmet mounted displays in both cockpits and an infrared search and track system, known as “Tiger Eyes,” built into the left intake targeting pod pylon. The F-15SA also features F-110- GE-129 engines, capable of putting out almost 30,000 pounds of thrust each. When it comes to weapons, the F-15SA can carry almost anything in the inventory. In the incredible image above showing an “extreme multi-role loadout” it packs: 2x AIM-120AMRAAMs, 2x AIM-9X Sidewinders, 2x AGM-84 SLAM-ERs, 2x AGM-88 HARMs, 6x GBU-54/B Laser JDAMs, and 8x GBU-39/B Small Diameter Bombs. Also, the F-15SA still packs the F-15E’s 20mm Vulcan cannon with 540 rounds available. Basically, with this jet you get a tactical fighter force “in a box.” The loadout shown above includes weapons for long-range stand-off deep-strike, suppression of enemy air defenses (SEAD), counter-air, direct precision attack and standoff precision attack all on the jet at the same time. Even after all that, the F-15SA’s center-line station remains unused, which can accommodate up to a 2,000lb JDAM, an external fuel tank or even a synthetic aperture radar surveillance pod. The image above shows the F-15SA once again, albeit this time it is in an air-to-air configuration, including no less than eight AIM-120 AMRAAMs and eight AIM-9X Sidewinders. This amounts to double the missile carrying capability of the F-15C or F-15E. Also note the Infrared Search and Track system mounted above the jet’s radome. 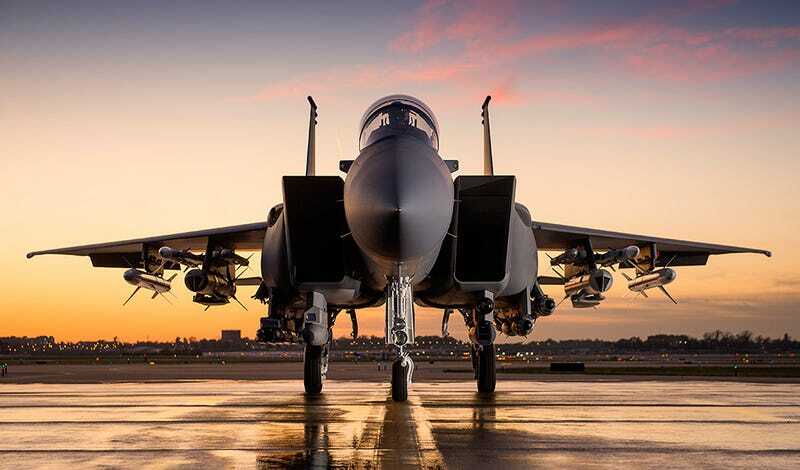 This, combined with its state of the art radar’s low probability of intercept modes, advanced radar warning receiver and Link 16 data-link, allows the F-15SA to hunt for enemy aircraft in electromagnetic silence while still maintain high-situational awareness. Boeing’s Silent Eagle features internal weapons bays in its conformal fuel tanks and low-observable improvements such as canted tails, radar absorbent coatings and radar blockers on its engine fan faces. The aircraft can be converted to a large load carrying non-stealthy configuration much like the F-15SA in a matter of hours. Many of the improvements made in the penultimate F-15SA were also rolled into the even more advanced and stealthier F-15 Silent Eagle, an aircraft that has not found a customer in the fighter marketplace yet, especially since South Korea chose to procure the F-35 on its last fighter buy and other F-15 operators, like Japan, Israel, also did the same. Even if the Eagle line ends with the F-15SA, it is amazing how far the aircraft has come since its original use as an attack aircraft some 30 years ago.